N.J.A.C. 7:26-3.2 Registration at (a) states that "no person shall engage in or continue to engage in the transportation of solid waste in this State without first obtaining an approved registration statement from the Department." Only vehicles properly registered, pursuant to N.J.A.C. 7:26-3, with the Department, unless exempt from the registration requirements pursuant to N.J.A.C. 7:26-3.3, and displaying the appropriate registration number and solid waste decal shall be admitted for loading and unloading of any solid waste at the facility. The facility shall be operated in accordance with N.J.A.C. 7:26-2.11. In accordance with N.J.A.C. 7:26-3.4(h), et. seq., the State of New Jersey Department of Environmental Protection issues registration decals. 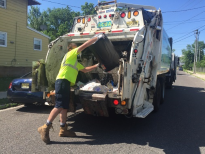 Each solid waste transporter is permanently assigned his own specific four or five-digit NJDEP registration number. N.J.A.C. 7:26-3.4 (h) requires that all registrants display their vehicle NJDEP numbers in "numbers at least three inches in height". It further states that "in numbers at least three inches in height, the capacity of the vehicle in cubic yards, in tons or in gallons, with the appropriate unit designated, shall be permanently affixed on both sides of the solid waste vehicle so as to be visible to the operator of the solid waste facility." The registrant in contrasting colors on each registered vehicle and component must display this information. • Persons transporting only their own solid waste in vehicles registered with a State motor vehicles agency as having a maximum gross vehicle weight of 9,000 pounds for a single vehicle or 16,000 pounds combined maximum gross vehicle weight for a vehicle pulling a trailer. The NJDEP Registration or Temporary Letter of Registration must be located in the vehicle and available for presentation to the Weighmaster upon request. The NJDEP number must be clearly displayed on the driver's side of the vehicle in visible three-inch numbers, along with vehicle capacity. The Origin and Disposal Form must show the vehicle's NJDEP number along with the corresponding license plate number. The NJDEP registration number shown on this registration must match the NJDEP number displayed on the vehicle. Additionally, new self-generator NJDEP Registration applications may be obtained through the Atlantic County Health Department by calling 645-5972.